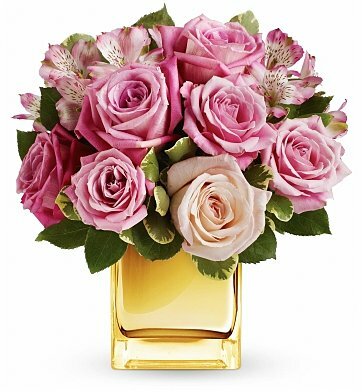 Ravishing roses and a gleaming cube vase combine to stunning effect in this amazing arrangement featuring soft, romantic shades of pink and lavender. It's sure to make her heart radiate with love and affection! Ballet Slipper Pink Roses (40 cm). Pink Alstroemeria, Lush Greenery and more. Standard Arrangement Measures 11" x 12". Radiant Romance is a hand delivered gift. These gifts are delivered by one of our local design centers located throughout the United States and Canada. Same day delivery is available for most gifts when ordered before the cutoff time. The cutoff time for Radiant Romance is 10 AM in the recipient's time zone.